Smoljanac is the right destination for your vacation? Zoran is the name of this object, located in Smoljanac. Zoran has a secured parking, which is another advantage of this accommodation, and is of crucial importance if you travel by car on your vacation. During your vacation, most people love to prepare fish or meat on the grill for dinner or lunch. And after dinner enjoy the night in a pleasant company. The object "Zoran" has Grill, so if you like barbecues then you will definitely enjoy staying in this object. If you are traveling with a pet then you will be positively surprised because this facility has the option of accepting pets. Pet friendly accommodation - only by prior arrangement with the agency (extra fee paid to host). Any additional questions related to the beach or destination Smoljanac please check with your host because they still know best the location. We wish you a warm welcome to our facility Zoran in destination Smoljanac. 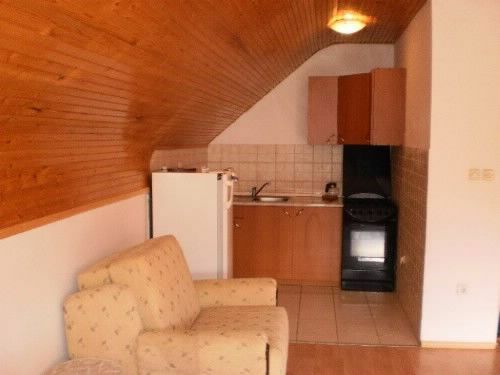 Accommodation Zoran is located 6000 m from the entrance to the National Park Plitvice. Private accommodation Zoran is ideal for 6 persons and has 2 rooms in the accommodation. Accommodation is equipped with: Television, Internet. Pet friendly accommodation - only by prior arrangement with the agency (extra fee paid to host). Attention! The right GPS location is N 44° 56.492'' E 15° 38.498'' !!! It''s a clean house with a good comfort. The location is a few kilometers away from the main street, so very silent and perfect for a good sleep. The owner is very friendly and there''s a very good WIFI. In summary I would recommend this house for short stays. Magnifique randonnée autours des lacs! Tágas, bőven elfértünk hatan. Nagyon jó, hogy van a ház mellett egy kis terasz, ahova ki lehet ülni. - A konyhai felszerelés hiánya nagyon zavaró. Mivel nincs mikró így gázon kell melegíteni, ami önmagában nem lenne baj, de egy darab óriási lábos volt az egész házban. Poharak sem voltak. Úgy kellett kérnünk a tulajdonos lányától (mivel csak ő beszél angolul) kávémelegítő edénykét, egy kisebb lábast, merőkanalat. Hosszabb távon, illetve nagyon főzésekre ez a konyha így semmiképpen nem alkalmas.